6 years since I posted this one. 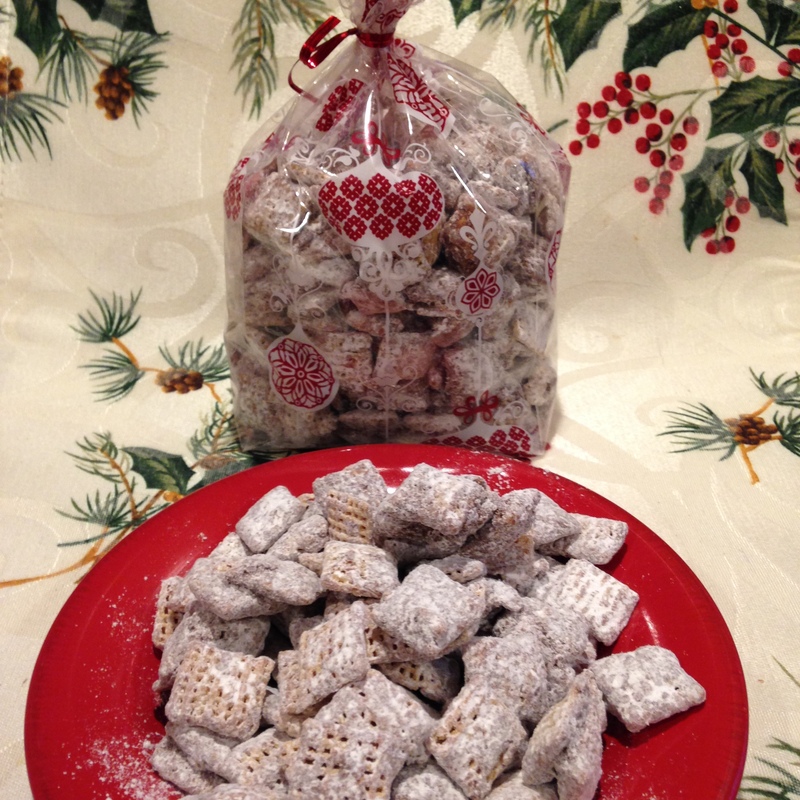 Reposting this tasty Christmas tradition. Give it a try this weekend!! Merry Christmas!! I have always enjoyed the combination of chocolate and peppermint. Peppermint Patties have been a favorite confection of mine for many years. When I bought a candle for Rachel this year from Bath and Body Works they had a recipe attached. (Yes, Bath and Body Works recipe!) She thought this would be a fun recipe to make along with the Christmas cookies we made. It was an awesome choice! Surprisingly, it was a great recipe from a store that sells body lotions and candles. 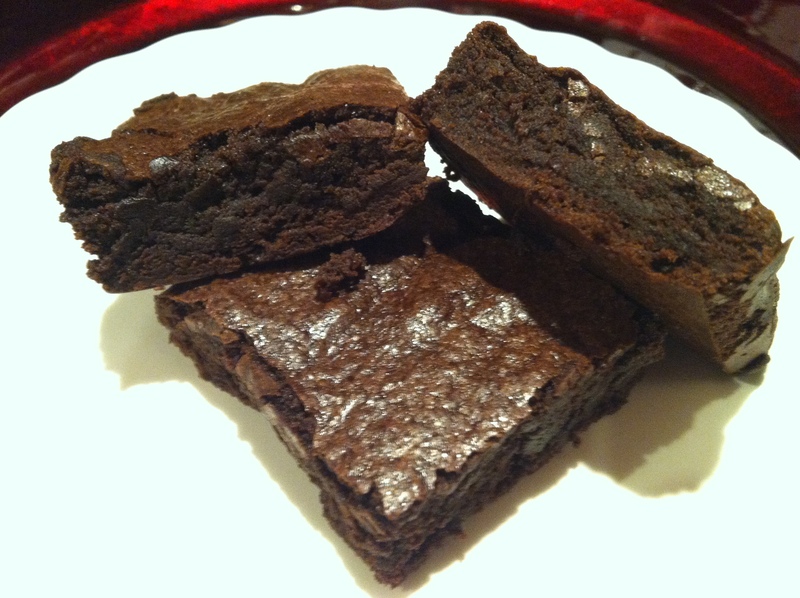 We did make a couple of changes so you will be getting the recipe I made. I tried to find their recipe online but was unable to locate it. Needless to say this is a very “simple and delicious” recipe. I wanted to get this on my blog so you could try it this year. HO, HO, HO!!! 1. To create bottom layer of bark, melt the dark chocolate chips and 1 Tablespoon of butter in microwave, at 30 second intervals. Stir after each 30 second interval. (It took about 4 – 30 second intervals to get to a creamy texture.) When smooth and creamy, spread mixture in a greased 13″x9″ cake pan. I used a glass dish. (You could also add 1/2 cup of whole coffee beans. I thought 3 different chocolates was plenty of caffeine for my family! Rachel agreed!!) After you spread in the dish, put in freezer for 15 minutes. 2. Melt milk chocolate chips and 1 Tablespoon of butter in microwave at 30 second intervals, stir until smooth and creamy. Add 1 cup of crushed Oreos. Spread mixture over the dark chocolate. Freeze this mixture for 15 minutes. 5. Refrigerate 3-4 hours. Break into pieces and ENJOY!! This would be an awesome gift. It is very easy and fun to make. Hope you enjoy it as much as we did. Merry Christmas!! I have wanted to make Baklava for at least 10 years. I have been a bit hesitant and decided this year to just do it. Martin called his grandma to get her recipe. We discussed and we did her recipe with a few tweaks of our own. Layout phyllo dough and cover with damp towel. They dry out fast. I learned that today! I cut the dough in half and that was the perfect size for my 9×13 metal baking pan. Preheat oven to 350 degrees. Melt those sticks of butter. Mix together the nut filling ingredients. Here is where Grandma Olga comes into play. Her way of making baklava is not the usual process you see and read about. Lightly oil the baking pan. I used sunflower oil. You can use vegetable oil. Pour the 3 1/2 sticks of melted butter into every nook and cranny. Bake at 350 degrees for 45 minutes or until top is golden brown. While the baklava is baking, make the syrup. Put all ingredients in saucepan. Over medium heat stir occasionally until sugar is dissolved. When baklava is done baking. Set aside to cool. (I put in the cold garage as my fridge was full. If you are lucky enough to have room in your fridge this time of year, after it cools a bit put it in there.) When cooled pour the warm syrup over the entire pan. Lightly cover with a towel. Let set for at least 6 hours. Overnight is best. This was absolutely delicious. I can’t wait to make again. Next time, pistachios with almond flavoring. Hmmm, maybe for New Years Eve!! We always have fruit in our home. I can always pick up berries. Our favorites; strawberries, raspberries, blueberries and blackberries. Occasionally we like to add some extra sweetness to our fruit especially on Friday nights. Mix above together. Top on your fruit. Fall is in the air. Baked this simple and delicious cobbler. Everyone loved this one. Use your favorite sugar cookie recipe. I used my Cinnamon Cookie aka Snickerdoodle Cookie recipe. Preheat oven to 375 degrees. Spray 9inch deep dish pie plate with cooking spray. In a large bowl, gently toss fruit mixture ingredients until apple slices are coated. Pour evenly into pie plate. In small bowl mix granulated sugar and 1/4 teaspoon cinnamon. Bake 50-55 minutes or until topping is golden brown. Cool slightly before serving. Top with ice cream, whipped cream or whatever your little heart desires! Your home will smell fabulous! ENJOY! Whoa, this new program with WordPress makes the photos gigundo!! Pop that popcorn!! Whether you buy the microwave kind or kernels to pop in a stock pot. Place sugar, corn syrup, water, vinegar and salt in a medium saucepan and stir to combine. Place over high heat, stirring until the sugar is dissolved. That takes about 2-5 minutes. Bring to a boil and cook until mixture registers 260 degrees on a candy thermometer. That will take 7-10 minutes. (I used a thermometer. If you don’t 10 minutes will be enough time.) Stirring periodically and pay attention! Remove from heat and stir in butter and vanilla until melted and smooth. Immediately drizzle sugar mixture over popcorn and stir continuously with a rubber spatula. Scrape the bottom of the bowl, the syrup settles at the bottom. Make sure you mix thoroughly. Using buttered or oiled hands, tightly press mixture into 3 inch rounds. (I buttered my hands) Place on parchment paper to cool completely, about 10 minutes. Eat them up. They are delicious. Eric and Rachel LOVED them!! Preheat oven to 375 degrees. Put rack in lowest position. 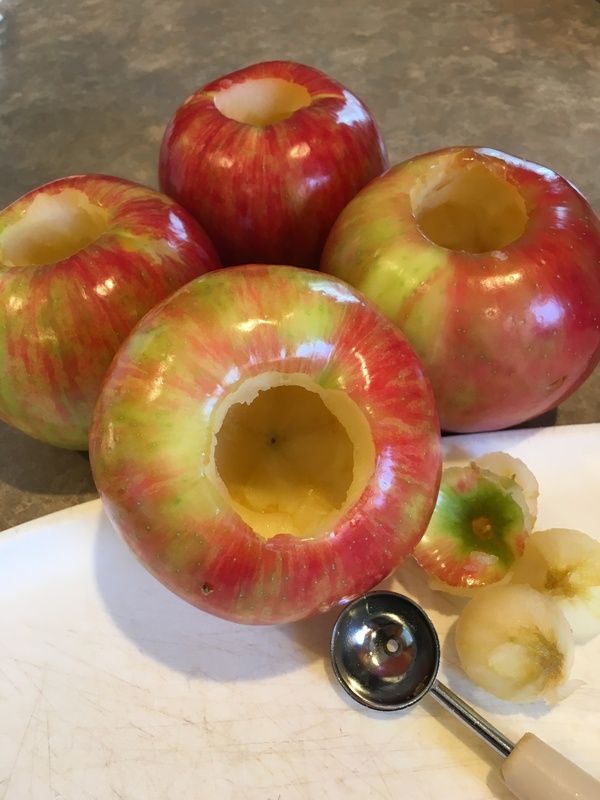 Remove the core of the apples, cutting to within a half-inch of the bottom of the apple and creating a well roughly 3/4-inch wide. I used a melon baller. 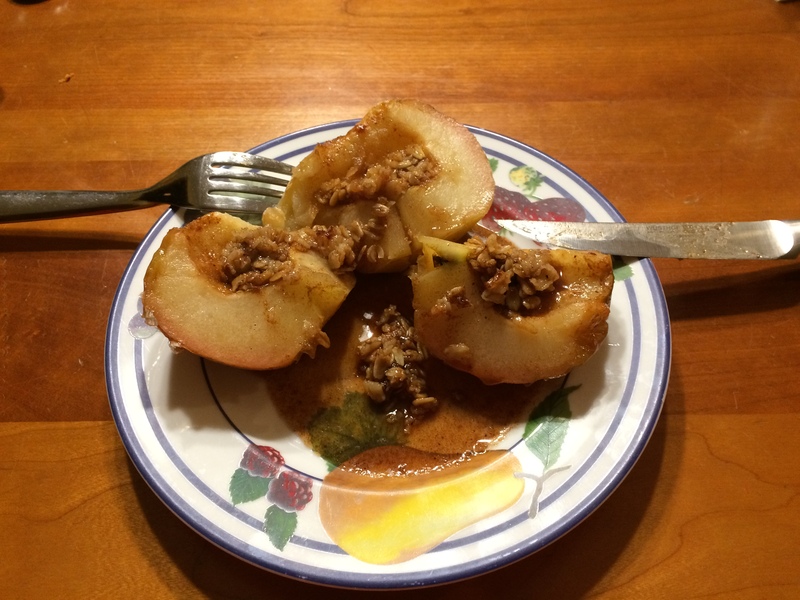 You could use an apple corer or a paring knife to hollow out the apple. Mix the brown sugar, oatmeal, cinnamon, nutmeg, cloves in a bowl. 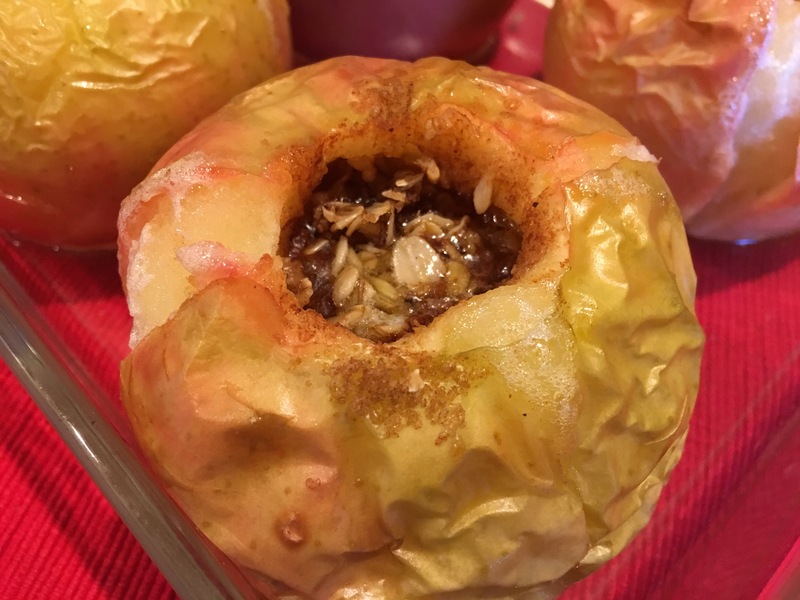 Divide this mixture between the apples, pack firmly into the hollowed space. 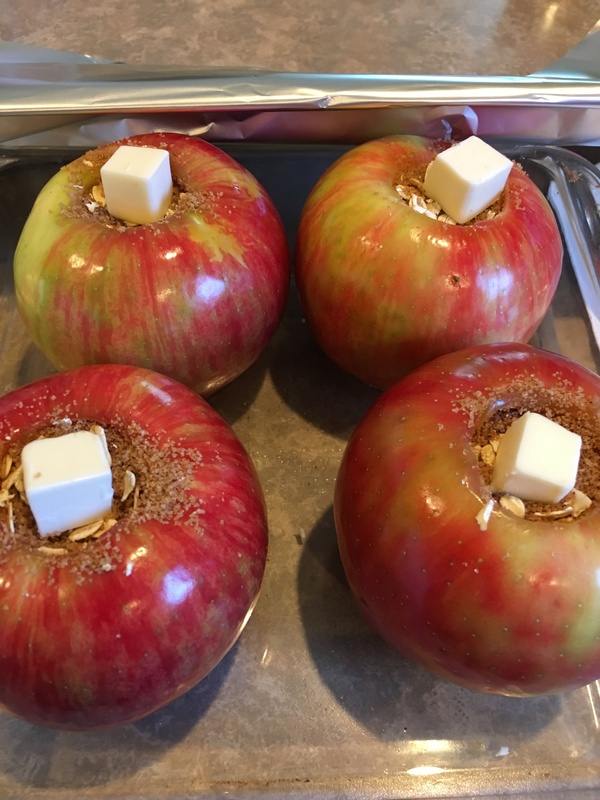 Arrange the apples in an 8×8 baking dish (the apples fit perfectly!) and top each one with a pat of butter. Pour the water into the bottom of the dish and cover loosely with aluminum foil. You can eat as is or serve with ice cream or whipped cream. YUM!! 2. Add simple syrup, Hendricks Gin, and crushed ice. Top shaker with shaker glass and seal. Shake vigorously for 15 seconds. 3. Place sliced cucumber in bottom of glass. Top with crushed ice. 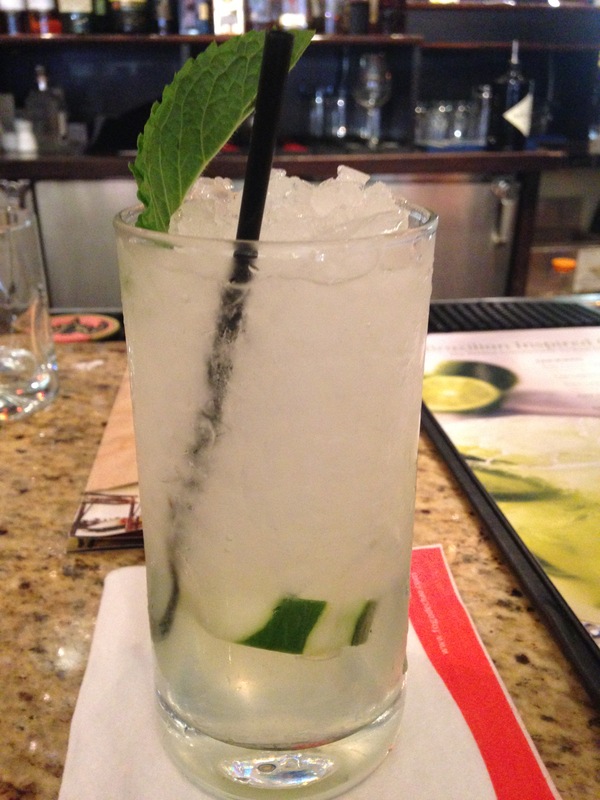 Strain the drink into your glass and top with a mint leaf. 4. Serve at once, and enjoy! Note: If you do not have crushed ice, get a clean towel and place ice into the towel and hit it with rolling pin or hammer to crush the ice. Can’t wait to make this one. Had to post so I don’t forget to make this refreshing cocktail!! Here is the most ridiculously simple sweet treat recipe you can make. The recipe is off of a Chex cereal box. Not a personal favorite but the 20 somethings seem to enjoy it. I made some as a gift for Jenni from work. Lily and Paige popped over Sunday and they took the rest of it home. Paige certainly enjoyed “chowing” down on it while visiting! Simple and Delicious!! 1. Measure cereal into a large bowl; set aside.